The Source: Purchased at All romance. 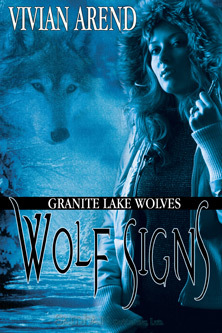 I love Vivian Arend’s Granite Wolves series, and I have been intending to review them for awhile. It was a delight to re-visit the pack again. The setting in wilderness at the border between Alaska and Yukon felt believable. I could almost feel the cold air, hear the sound of skis flying over the snow covered lake. And it felt utterly logical that there was a werewolf pack in the area. Normally, I don’t like instant love, but Ms Arend managed to make Robyn and Keil’s romance feel very believable. Part of the reason was that she allowed them to get to know each other before making love. Another part was that she gave Robyn time to adjust to the fact that werewolves existed. I loved the banter between Keil and TJ, although Keil wished TJ wasn’t there occassionally. I just wish it had been a bit longer, but that’s the greedy reader in me. LOL!